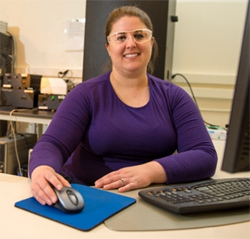 Jennifer Steeb (CSE) has been with Argonne as a postdoctoral researcher since 2010. Recently Steeb was promoted to a full-time, staff scientist position as an assistant chemist in the Chemical Sciences and Engineering Division. Steeb is also the first student of the Department of Homeland Security’s Domestic Nuclear Detection Office (DHS-DNDO) to achieve a full-time staff position. The DHS-DNDO created the National Nuclear Forensics Expertise Development Program to establish uniquely qualified researchers with technical expertise in nuclear forensics. Steeb was selected for the program to help ensure a ready, robust and enduring nuclear forensics security capability for the nation to prevent and deter nuclear terrorism. DHS-DNDO prepares candidates with skills in centralized planning, project management, integration, assessment and stewardship of the nation’s nuclear forensics capabilities. Steeb progressed through a rigorous development program that trained her in the collection, analysis and evaluation of radiological and nuclear material. She is trained in nuclear forensic investigation of nuclear and radiological materials in a pre-detonation (intact) state. Steeb began her training as a DNDO Nuclear Forensics Graduate Fellow with joint sponsorship from DHS and the Department of Defense upon her graduation from the Georgia Institute of Technology in 2010. She spent her three-year postdoctoral appointment at Argonne solving challenging nuclear forensics problems in an effort to secure our nation’s security. Steeb research work was varied and never the same as a postdoc. She devoted her days to new experiments, learning different analytical techniques and applying new methods. Her schedule hasn’t changed much now that she is a full-time, staff scientist. “There never is a dull day!” says Steeb. Steeb also devotes time to encouraging students, especially young women and girls, to pursue careers in Science, Technology, Engineering and Math (STEM). She has taken part in Argonne’s annual Introduce a Girl to Engineering Day and Science Careers in Search of Women, acting as a mentor and presenter. Steeb was encouraged as a young woman to stay involved in science and research activities by her parents. She credits her high school chemistry teacher as an excellent role model that inspired her to become a chemist and pursue college. Today, Steeb’s current research interests are developing a method for age-dating radiological sealed sources and exploring studies on uranium morphology for nuclear forensics. In recognition of her accomplishments the Acting Director of the Domestic Nuclear Detection Office, Huban A. Gowadia, sent a congratulatory letter to Steeb. “I commend you on your achievement and wish you much success and fulfillment in all your future endeavors,” noted Huban A. Gowadia. Steeb holds a Ph.D. in Chemistry from Georgia Institute of Technology and a Bachelor in Chemistry from the University of Miami. This entry was posted in Postdoc Spotlight and tagged Jennifer Steeb, postdoc spotlight. Bookmark the permalink.